Sir Tony Brenton KCMG, Professor Anatol Lieven and John Lough discussed the question, ‘Putin Redux: What’s Next for Russia And Its Relations With The West?’ in a debate chaired by Lord Anderson of Swansea on Tuesday 6th March. Two days after the elections in Russia returned Vladimir Putin to the Russian presidency, GSF held a debate to discuss this outcome and the effects it would have both internally in Russia and in terms of the Kremlin’s foreign relations. 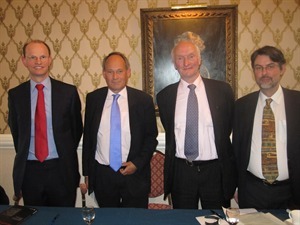 From left to right, John Lough, Associate Fellow of the Russia & Eurasia Programme at Chatham House,Sir Tony Brenton, former UK Ambassador to Russia,Lord Anderson of Swansea (in the chair) andProfessor Anatol Lieven of the Department of War Studies, King’s College, took part in the debate. There was consensus amongst the panellists that while there was ‘widespread and plausible’ accusations of fraud in the elections and a continuing civic upsurge against the regime, Putin would nonetheless have achieved victory, not least because as Anatol Lieven pointed out, the opposition is ‘deeply divided’ and cannot ‘come up with a united anti-Putin candidate’. The panellists agreed that economic modernisation in Russia was Putin’s key task ahead. John Lough said that many issues would be decided in the economy – while there were no short-term problems, Russia’s economy remained ‘disproportionately exposed to the oil price’, and issues such as demographics and the lack of high quality educational delivery in Russia would become factors. Anatol Lieven hoped that Putin would accept this as his last term and that progressive elements in the regime would start to ‘reach out to the opposition to diffuse public anger’, while John Lough expressed doubts that Putin would survive the full term. Tony Brenton referred to Putin’s public appeal as the man who had returned stability and national pride to Russia, although John Lough felt that he was a ‘diminished figure’, who had lost his reputation as a ‘teflon President’ and that his return to the Kremlin was a ‘sign of weakness in a system extremely dependent on one person’. He did not know if Putin could build more effective institutions and put in place a set of reforms to move the country forward and said that it was not clear how Russia would break out of the cycle and the barriers created by preserving a non-competitive system. He felt that expectations needed to be realistic and that Russia would likely find itself steering between a course of ‘stagnation plus’ and ‘stagnation minus’. There was some agreement that while, as Tony Brenton said, Russo-Western relations had been going through a rough patch, Putin’s strident anti-western stance was more a reflection of election campaign posturing than of reality. Anatol Lieven agreed that Putin thought he could win a ‘measure of public support by taking an anti-western line’, but did not think that it would be reflected in policy. Tony Brenton said that while Russia had been unhelpful on the Middle East, the Arab Spring and on Syria on the grounds that they were ‘deeply averse to any western-sponsored overthrowing of rulers in Syria or anywhere else in the world’, in Afghanistan and in Iran, he felt that the Russians had been more helpful, not least in their decision not to sell the Iranians their most advanced anti-aircraft system. He pointed out that in international affairs, Russia was not always wrong. John Lough said that Russia’s stance on Syria was a ‘litmus test’ and a possible ‘dress rehearsal for what might happen with Iran.’ Tony Brenton felt that the regime needed to find a way through the current domestic pressures and tensions and that anti-westernism could remain a card for Putin, given that Russia’s foreign policy stance was very often a reflection of domestic pressures. Audience questions were asked on Syria, the relationship between the Duma and the Presidency, Russia’s reaction to a Israeli-Iran strike, the inadvisability of western ‘Russia-bashing’, the Russian opposition, Kazakhstan; and corruption in Russia. To listen to the debate, please click here.